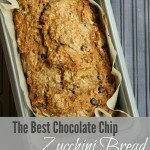 Moist, delicious and loaded with nutrients this Chocolate Chip Zucchini Bread Recipe will be the best you've ever had! Mix together flours, brown sugar, flax, cinnamon, baking soda and salt. In a separate bowl mix egg, butter, vanilla and applesauce together. Add zucchini to wet mixture. Mix wet and dry mixtures together just until thoroughly mixed. Line a loaf pan with parchment paper and pour mixture in. Shake pan to get mixture to settle into parchment paper and trim and excess paper. Bake for 45-55 mins until a toothpick inserted comes out clean. Let cool in pan then lift out with parchment paper.